You have not heard them, so......maybe reserve judgment until you have. I am certainly looking forward to hearing them; the driver technology is impressive and the build quality is way to advanced for even highly skilled DIY ers. I have a smallish room and neighbours so high spl levels are not needed so they would suit my circumstances. version of them is going to be inevitable. the bracing seems again a detail of a budget basic cabinet. up. The manual is pure AV territory, a real dead giveaway. and it won't get much from that sort of intended market. As anything approaching a genuine small studio reference monitor. Last edited by sreten; 22nd August 2012 at 11:54 AM. They are DIY available, but intermittently it seems. I don't know how different the Q-series, R100, and LS50 drivers are (they all have slightly different cones, but otherwise not so sure; the other R-Series Uni-Q's are quite different, as dedicated midranges with much smaller surrounds), but several weeks ago I tried to get three of the R100 drivers from Speaker Exchange and never got a price or availability. Note that the Q100 driver has been going up in price, too: from $88 when I first looked to $112 when Krutke tested them to $120 as of this writing. 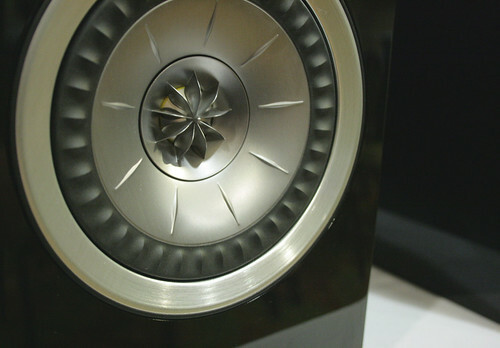 There already is, albeit with flat baffle and a markedly less gaudy cone: KEF R100. Why is the lack of buy-wire terminals a bad/"budget" thing? My main beef with the LS50 is simply that it's ugly. It would look much better with standard back or silver diaphragms, and a grill. you maybe right in what you say, but I still think that the driver could prove to be worth while investigating. With the combination of an unusually large magnet for the size of diaphragm and again unusually wide diameter voice coil, makes me think that it might offer something that a lot of other drivers do not. I could be wrong, but I am not aware of any other drivers like this! Kef do have considerable resources at hand for this sort of thing and a good reputation so they cannot be dismissed yet. They received very good feedback from the Munich show in May and have obtained an EISA award so that does say something. I doubt I will get a chance to hear then until I am in London next which maybe around Christmas time. I will search them out. The driver is simply a gold version of the silver Q100 driver. I'm sorry but I smell a rat, and a rotting decaying one. address from years ago, seems a huge con to me. "Made in England" still has big kudos in some markets. IMO they are very near simply the next Q100 version. Which will sell for about half the price, moreorless. no marketing whatsover related towards studio use. is happening here, as no doubt time will confirm. where the idea has no commercial advantage at all. the Q100 driver is tested here, see June 4, 2012. Last edited by sreten; 22nd August 2012 at 10:28 PM. I'm sorry, but no reasonable person with functioning eyesight could draw your conclusion. Clearly, one speaker's woofer cone has radial ribs, whereas the other does not. There may be differences in the tweeter, too. I don't know. And as for suspension or motor differences (if any) between the three, that's not clear. All three drivers are clearly different from the R-Series midrange. Given that KEF's Q-Series has 3 distinct Uni-Q drivers (a 5.5"/1", a 6.5"/1", and an 8"/1.5") it wouldn't surprise me if the LS driver is different from the R100 driver. Doubtful. They're more like a tarted up version of the R100, sold at a $300 premium in the US market compared to the R100. Me, if I'd rather have KEF's R300 for another $300 or so over the LS50. The extra money gets you a less gaudy driver, a Uni-Q that's a dedicated midrange (smaller surround, more efficient) a 3-way design, and a grill. In the real world, given that the LS50 is only sold through KEF Direct, one likely get the R300 for the same price as the LS50, or less. Last edited by Pallas; 23rd August 2012 at 02:15 AM. I looked at the Zaph Audio measurements and summary of the drive unit and well, what more can one say? He gives some positive comments on the measurements, and a full set of T/S parameters. They do seem to be worth experimenting with. I am looking for a supplier in the UK as shipping from the States is going to be too expensive. The drivers themselves are not that much. $112.00 from the Speaker Exchange. To be clear, Krutke measured the Q100 drive unit and not the LS50 drive unit, which is a different unit as anyone with functioning eyesight can tell from pictures. If both drivers were in front of a person, that person would have to be blind AND suffer from severe neuropathy to fail to recognize them as different drivers. The radial ribs on the cone of one but not the other mark them as conclusively different drive-units. So Any claim that they are the same is made negligently at best. Now, whether the two obviously different drivers perform substantially the same is, of course, entirely unknown to everyone outside of KEF or any associated third-party build-houses. Only one of the two clearly-to-the-naked-eye different drive-units has been tested by a third party. And yes, the Q100's concentric is an excellent device for its size and designed dispersion pattern. I think a DIYer would be hard-pressed to build a better-sounding all around speaker than the KEF Q100 for just ~$500 or so. At least, a better speaker under the same size constraints. Most can't do it for $50,000! Last edited by Pallas; 23rd August 2012 at 08:34 PM. I know that the Zaph Audio tests were done only on the Q100 driver and not the different looking driver from the LS50 and "R" series, but the point is that this new driver has some significant offerings with regard to dispersion and integration between the bass and tweeter. one can only assume that the "R" series and LS50 drivers are in some way superior to the Q100 driver. Although, it could be that they are essentially the same with just a slightly modified cone design....who know's!? It would be really nice if KEF could make these drivers widely available to the DIY community as I am sure that some very interesting alternative box designs would emerge as a result. On Valve amplifiers and (particularly early 1970's) low feedback solid state amplifiers I would agree that that buy-wiring (good if unconventional name for "bi wiring") is a waste of time. In my experiences Bi amping does provide a similar and greater benefit to that of "buy-wiring", supporting these cheaper and more expensive upgrades may well make "commercial advantage" due to fashion in your local "commercial environment". Though many might consider the extra wires a drawback, and the cost of an extra amplifier prohibitive. Factor in (A) the low output resistances of many solid state amplifiers (high feedback designs). Factor in (B) the resistance of the connections, plus speaker cable. It may surprise you to realize that the the (A) is much less than (B) to (A) is less than (B) is more often true than its not true. Especially for mostly casual consumers of a set of Speakers and an Amplifier in the UK and Germany. Simple Ohms law and the power law, calculations suggest their will be an effect with bi wiring for all values of A <= B.
I am not a good HiFi shopper as I tend to buy second hand and restore HiFi, even so I am not convinced that cones driven magnetic speakers age well, having tried many second hand speakers. That said a pair of higher on the range castle speakers I had second hand sounded remarkably good until the foam rotted, it had bi wiring. I tested bi wiring on some old castles speakers (on the insistence of a friend) before I had done the maths, and was surprised that it sounded marginally better, but bi amping (match gains and phase or get two identical amps) provided a significant improvement, going active and building your own line level analogue crossovers proved tricky with ears to measure, and above my resources at the time I last tried it (though this current attempt with a measurement microphone is going better). Unless the speaker manufacturer provides an active cross over or you use a digital crossover. I have also tried this with a more robust second hand speaker by Linn with similar results. Unlike many others in this discussion, I actually heard the LS50 speaker. I thought it was one of the best things I heard at the Munich show. I am not a mini-monitor guy. In fact, I was demoing the biggest speakers there. I was walking down the hall and heard a reggae version of "Young, Gifted, and Black"--not a typical audio show selection. Stuck my head into the KEF room and it was the LS50 playing. Sounded very good from 50 feet away, in a very large room. I went in and had a listen. I was impressed. I would have to spend some time with the LS50 to pass judgement on suitability to be included in the "British studio monitor tradition." I owned a number of Rogers and Spendors and used JR150s for a few years in the 80s. 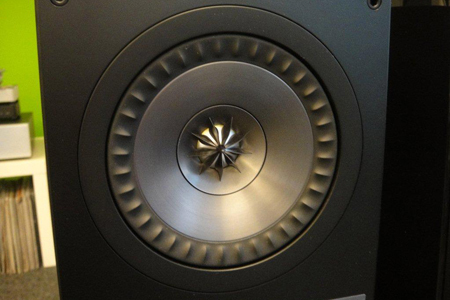 I don't remember any of them having the wow factor that the LS50 had for me but they were good long-term friends. How the LS50 would hold up to long close-listening experience remains to be seen. I listened to the KEF Blade last year and i was less impressed than with the LS50. All I can say is that it was a really compelling and coherent sound coming out of a small box, one of the most interesting commercial speakers I have heard lately. And I am the type of critic who thinks that 90% of what shows up at audio shows is tragic overpriced boring junk. LS 50 stuck me as a lot more successful than many speakers costing 10X, 20, 30X as much. So, this is all to say that I'd recommend an audition if I were shopping for a speaker with that form factor and general specifications. Rejecting the LS50s on the basis of the kind of abstract internet research I'm seeing in this thread would be a mistake, because this design seems to have a lot going for it.